Q: How do you know Saturn’s married? Of course there are a bunch of other fun space and physics jokes, erm, puns, but more on that later. 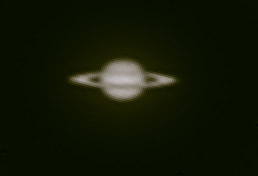 Saturn, f/8 AT10RCF, StarShoot Pro v2! Saturn is such a beautiful planet, even at the eyepiece, sometime I wonder why I don’t spend more time with planetary imaging. It was also the first planet that really hooked me on astronomy. This particular photo isn’t especially inspiring to look at, but I took it a little differently from what I woulud normally do for planetary imaging. In fact, I’m surprised it came out so well. First, this image is taken at the AT10RCF’s native f/8 focal ratio. Most often with planets, it’s posisble to really crank up the magnification with barlows and image at f/20 or more. Next, The AT10RCF, with it’s large central obstruction, generally is considered a non-planetary scope. Indeed, taking long exposures of the planet (trying to capture more moons), the spider veins holding the secondary explode across the field, rendering any moons no more than several saturn-diameters washed out. Lastly, this image was taken with the Orion Starshoot Pro v2 Deep Space Imaging CCD, not a webcam style planetary video camera. The only reason for this was that I didn’t want to break down the whole imaging train in the freezing night. So, given that I had three whammies against me, I was pretty pleased with the image despite it’s unusually small size. 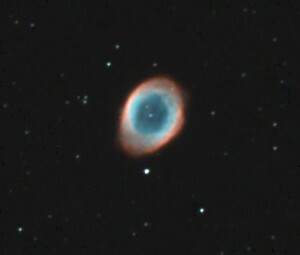 I selected 16 frames of 250ms to stack in registax and gently touched up the final image in CS5. The lyrid meteor shower was also in full effect last week. Meteors fly through the sky so fast that trying to pick them up with anything other than your eyes generally won’t work. It will, however, leave many streaks on any long exposure images! Of coruse, the lyrid’s are named such for their proximity to the constellation, Lyra. Easily identifiable by the incredibly bright magnitude 0 star, Vega, Lyra is also home to the wonderful Ring Nebula, M57. This image was created from a total of 90 minutes exposure, (9x 10m), stacked in Nebulosity and touched up in CS5. No broadband filters were used here. For the record, several meteor streaks did light up a few of the frames, but none so bad that any of the subs were ruined. Other than the constellation Cassiopeia, what other royal wedding themes space objects are out there? Or if you prefer, how about some good space jokes? This entry was posted by admin on April 30, 2011 at 9:49 am, and is filed under Nebulas, Planets. Follow any responses to this post through RSS 2.0.You can skip to the end and leave a response. Pinging is currently not allowed.